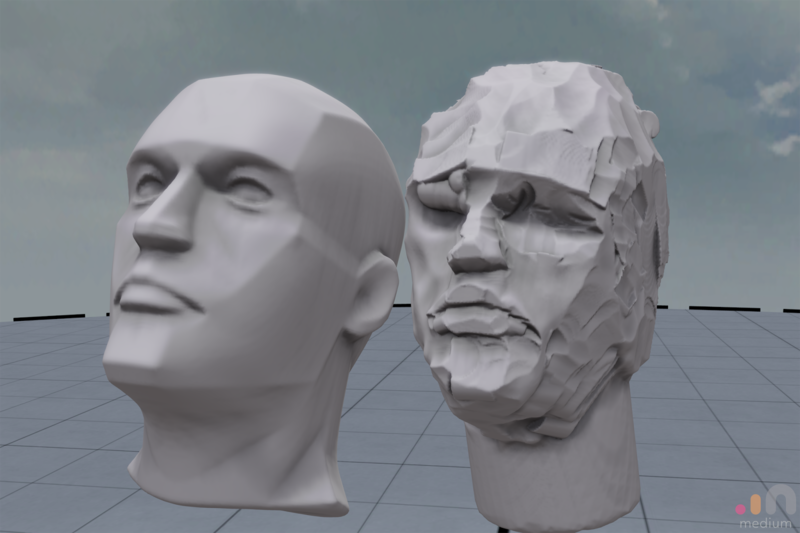 I've been sculpting a lot in VR lately (via Oculus Medium) trying to figure out whether it's "the future" or not. While I've worked in 3D for a long time, I'm used to building levels in a low polygon style with a 2D interface -- so for me, working "natively" in 3D VR has been strange and confusing, as I try to figure out how sculpting workflows work with 3D motion control interfaces. When you are 3D modeling in a 2D interface, you can only move in two dimensions at once for every operation. Every stroke is constrained to 2 directions, so you learn to limit how much "each stroke" is supposed to accomplish. You begin seeing 3D in a specific "2D" kind of way. A lot of existing modeling software has evolved to fit this workflow, using operational systems that are non-linear and asynchronous -- what I mean is that each time you move a vertex or apply a bevel in Maya, you can always tweak or adjust that action later. Need to twist a tentacle in a weird way? You setup a spline, and 10 clicks later, you have a twist. It's very accurate because you're working very methodically in super super slow motion, decompressing time. Current VR sculpting software doesn't really capture this "bullet time" dimension of working in 3D. Instead, it's very immediate and continuous. It's unclear whether VR will ever be able to support the high text density / menu complexity that most 3D modeling software needs. If you have shaky inexperienced hands, too bad! You can't fine-tune or adjust your tool movements after you perform them, you just have to get better at doing more fluid, cleaner hand gestures. So now I basically have to become a much better fine artist, and learn how to move my body around the sculpture, instead of simply trying to developing the eye of a fine artist. Some of this frustration is due to the difference between a sculpting workflow vs a polygon workflow, but the inability to rest a mouse on a table certainly exacerbates it. 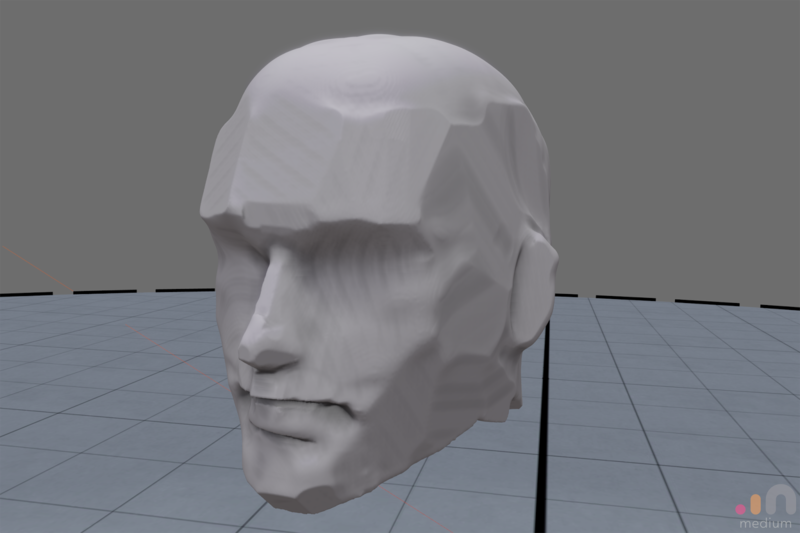 It also probably doesn't help that I'm taking on one of the most difficult topics of visual study possible, a human head. 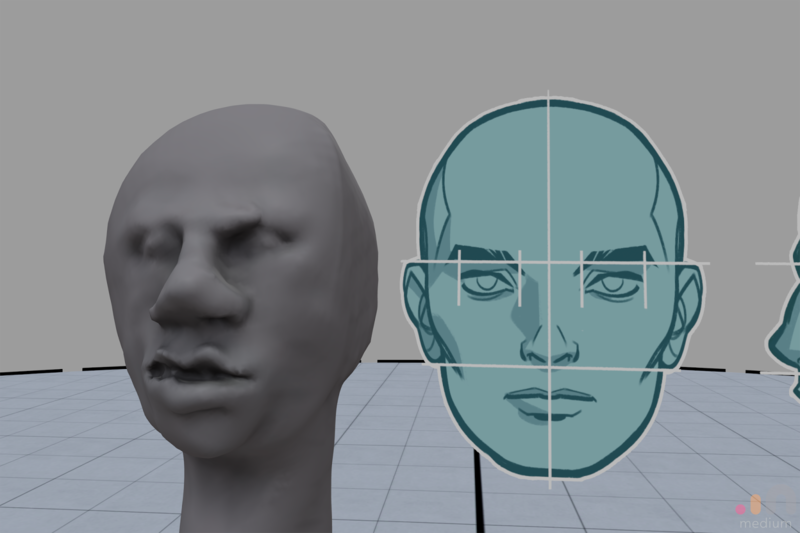 It's very easy to sculpt a "wrong-looking" blobby sculpture, as you can see in my screenshots! Fine artists usually spend many years in figure drawing workshops to train themselves how to "see" people and understand the many different shapes of our bones and muscles. But I think this challenge has been helpful, and it keeps me focused on figuring out which skills I need to develop. 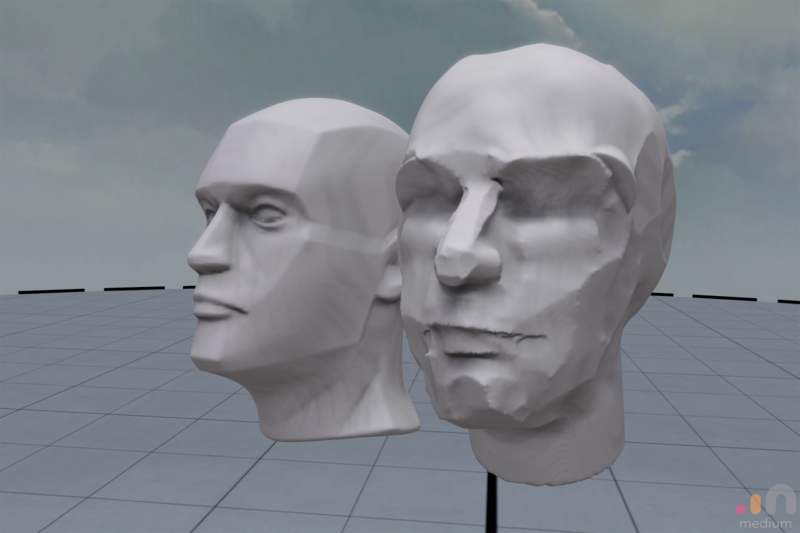 How do I get clean sharp edges and defined planes in VR? 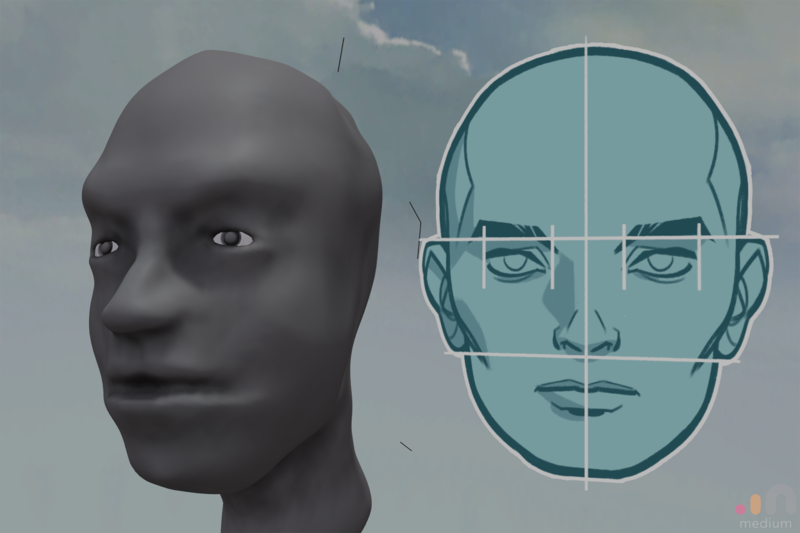 Should I sculpt with blobby spheres and flatten it out afterwards, or should I sculpt with flat cubes and build-up my planes from the beginning? I'm still trying to figure it all out. 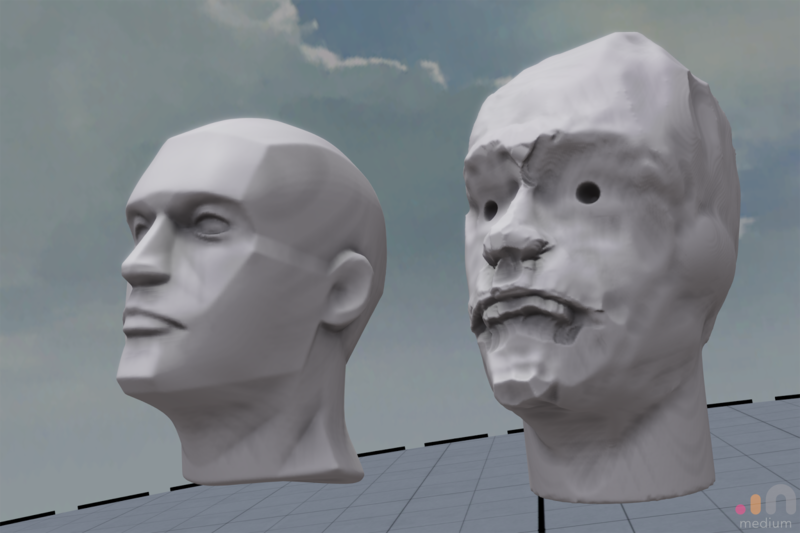 And if VR sculpting truly is the future, I do wonder how this will factor into a game development workflow. 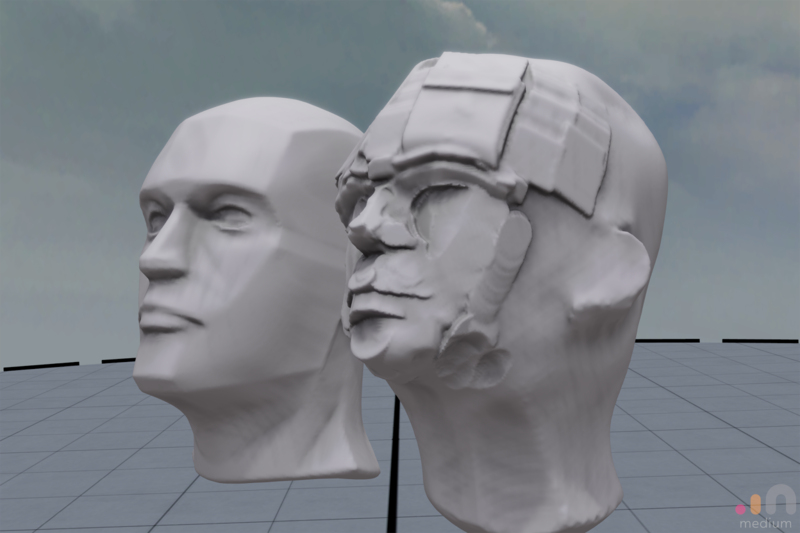 Maybe we'll sculpt basic forms in VR, and then bring them into Maya for fine-tuning -- or maybe it makes more sense the other way, to make basic forms in Maya, and then use VR only for detail? I don't know of any game artists who seriously use VR as part of their workflow, but if you know of any, let me know so I can figure out what they're doing and copy it! !